After you have completed your introductory training, you are eligible to become a club member. When you join the club, you agree to monthly payments, paid at the beginning of each month. There are no long term contracts. We ask that if you need to cancel or change your monthly payments, please give us 15 days' notice in advance. Select a membership from the options below. This is the standard membership, which includes all of the club's group practices and open bouting periods. Group practices include basic physical work (footwork, stretching, strengthening), fundamental blade skills (simple attacks, beat, press, closeout, parry, etc. ), and basic tactical training. After each group training is an open bouting period, where fencers can apply their training in matches with other members, socialize, repair equipment, and prepare for competition. 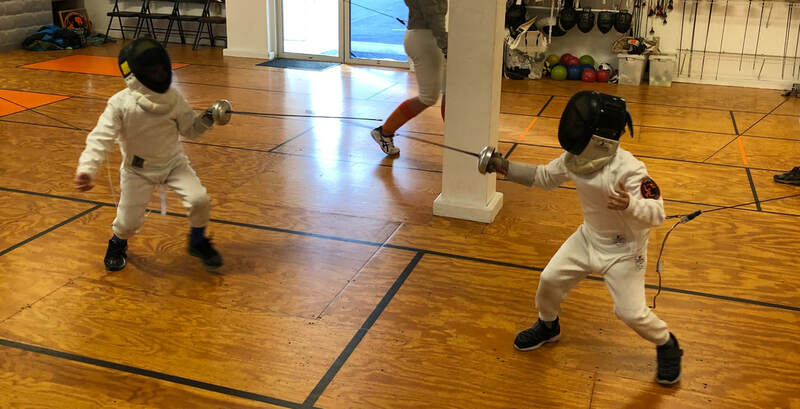 This membership includes a weekly private lesson, and all of the same group practices and open bouting periods as the Junior Varsity membership. Varsity members receive an individually tailored training plan, with goal setting and tracking, get discounts on and training in equipment repair, and receive more advanced, in-depth competitive training and support.